With the pace of new product announcements appearing to increase over the past few years, it seems appropriate to provide members with credible reviews on some of the most noteworthy products. This page will be updated frequently, so check back from time to time to see what new toy you might add to your wish list for birthdays, Christmas, etc! When the police are minutes away and the threat is seconds away…9-1-1…When you have to be you own first responder. 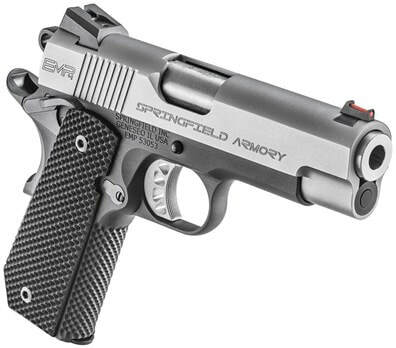 Springfield Armory's 911 .380 is the perfect pistol for your EVERY day carry. The lightweight 7075 T6 aluminum frame and black Nitride or stainless 416 steel slide measure 5.5 inches long and less then 4 inches high, with a snag-free profile that's undetectable under clothing. Springfield's Octo-Grip™ front strap texturing ensures a secure grip and is complimented by a G10 Octo-Grip™ textured mainspring housing. G10 Thin-line grips and a short reset, crisp 5-pound G10 trigger shoe by Hogue® come together to give the feel of shooting a full-sized firearm. Designed for life-saving defensive use at close range, the 911 features an ambidextrous safety and is perfectly matched with an Ameriglo® Pro-Glo™ green tritium front sight inside a yellow luminescent circle, and a tactical rack rear sight with green tritium inside of white luminescent circles. Approved for the most advanced and modern .380 defensive ammunition, the 911 comes with a flush 6-round and 7-round extended magazine. The Springfield Armory 911 is also offered with integrated green Viridian® laser grips, making target acquisition all but effortless. Learn more on the Springfield website - HERE. Last year I had my first opportunity to spend some quality time at the range with one of Springfield Armory's 1911-pattern EMP4 9 mm pistols. This series is set apart from the competition by the reduced dimensions of the grip frame. Springfield spent the time and money required to compress the traditional 1911 .45-ACP grip to fit the 9 mm cartridge, which is not as easy to do as one might think. 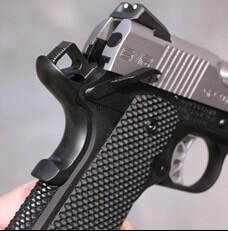 The combination of this shooting-hand-friendly grip configuration with the reduced recoil of 9 mm ammunition, lightweight aluminum frame, longer 4" barrel and top-notch controls led me to say of the EMP4 that, "It is one of the most well-balanced defensive single-stack 1911 pistols I've had the pleasure of working with." I'm not alone in this opinion because the EMP4 has been a popular model with critics and consumers alike. Just when I thought the EMP4 had reached a pinnacle in 9 mm pistol design, Springfield has served up a new model with an intriguing twist, or should I say, curve. Also known as a bobtail grip, the mainspring housing and heel of this pistol's grip frame have been rounded off. 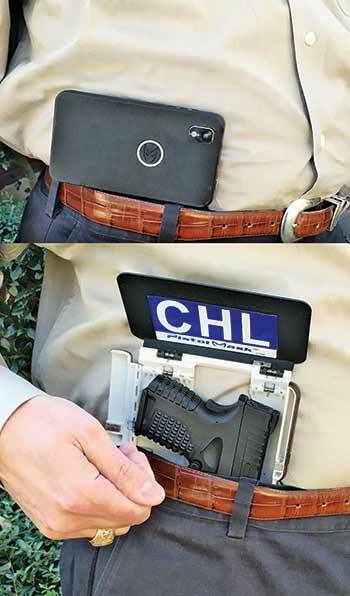 This makes the pistol easier to carry concealed because it eliminates the squared-off portion of the grip that tends to poke out or print through clothing. Depending on your hand size and personal preferences, a bobtailed grip can also feel more comfortable to shoot. Generally speaking, a bobtail grip is a custom feature that costs more because of the extra work needed to shape, polish and refinish the grip. Adding a bobtail to an existing pistol can cost upwards of $200. 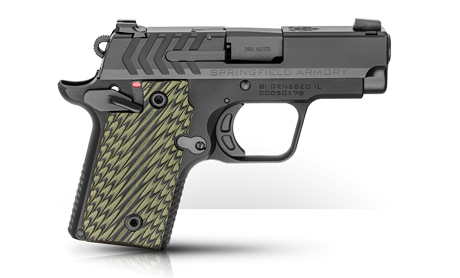 However, Springfield's in-house contour for this pistol is a real value at half the price. This version of the EMP4 two-tone, single-stack 1911 pistol retains the features that have kept this model selling like hot cakes. The satin finish stainless steel side has rear cocking serrations and a 3-dot sight system which employs a red fiber optic in front and a low profile white dot sight in back. The 4" stainless steel, match-grade bushing-less bull barrel sports a fully supported ramp. The full-length one-piece steel guide rod supports a single round wire recoil spring. How aggressive the texturing of a pistol's grip should be depends on which school of thought you choose to follow. Over the last few years we've seen more of the highly aggressive tactical textured G10 grips favored by military and law enforcement making their way into the civilian market. These toothy patterns bite into skin or glove fabric to provide a secure purchase in wet or cold environments. Old-school grips have light textures to prevent wear and tear on clothing. The EMP4 Contour grip effectively splits the difference with leanings toward the tactical side while not being so abrasive as to need to replace your wardrobe on a regular basis. The best performer of the test was the new Colt Defense 124-gr. jacketed hollow point, manufactured for Colt by Double Tap Ammunition. This load produced a best single group of 2.59" with an average of 2.75". Black Hills 115-gr. +P jacketed hollow points turned in a best group of 2.73" with an average of 2.90". Winchester PDX1 Defender 147-gr. bonded jacketed hollow points printed a best group of 2.84" with an average of 2.97". The new 4" barrel 9 mm EMP4 Concealed Carry Contour is another terrific example of how Springfield Armory is diligently working to tune this elegant century-old design to fit the needs of the modern concealed-carry practitioner. It's true that polymer single-stack 9 mm can weigh and cost less than this gun. However, they just don't have the same feel, light trigger pull, and accuracy potential right out of the box that this pistol provides. The new bobtail grip makes a very well balanced pistol just that much easier to carry. Accessories: Lockable Carry Case, Three 9-Round Blued Steel Magazines, Cable Lock, Owner's Manual. 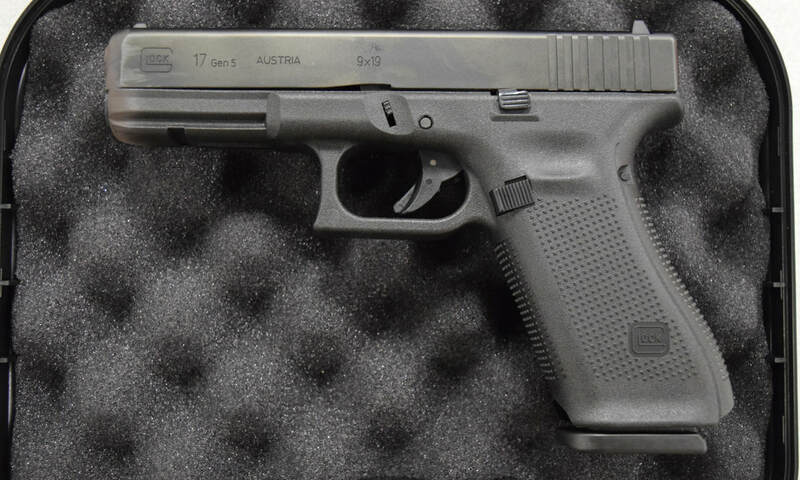 The fifth generation of the popular Glock handguns are no longer the stuff of myth and legend. No, they’re reported to be hitting stores in the next few days. Granted, Glock fanboys aren’t exactly the kind to camp out outside their favorite gun stores—these aren’t iPhones weren’t talking about here, after all—but there’s a fair bit of chatter about these. OK, much of it may just be in my house since I’m looking to pick up something that will work better for concealed carry that my CZ-75B, but there’s still chatter, dagnabbit! Anyway, there are a few features in the new generation of Glock perfection worth noting. In particularly, the profound lack of perfection that were the finger grooves on the front of the grip. While many people liked that on a pistol, it’s hardly universal. Further, the Glock is now even more of an ambidextrous pistol. The Gen 4’s reversible magazine release will now be paired with ambidextrous slide release. Good news for the lefties out there. The major feature changes include the addition of a Glock Marksmanship barrel with a new rifling and crown design; a flared magwell for easier magazine insertion; a throwback to earlier generations with the removal of finger grooves; an ambidextrous slide stop; and a new nDLC finish that “comes in all your favorite colors” as long as its black. Other than the obvious aesthetic differences, almost all of the changes are internal. Glock’s National Sales Manager Bob Radecki explained for the Gen 5, engineers removed a locking block pin, so there’s two instead of three; dehorned the nose of the gun; altered the magazine floorplate and dehorned the magazine follower; added a firing pin safety similar to the G42 and 43 models; added a new extractor; and the front rails have been reinforced. But there were also substantial changes to the trigger. 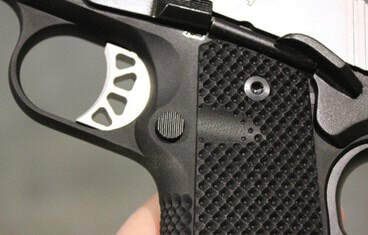 Radecki said the company added a trigger spring assembly that compresses instead of stretches; redesigned the trigger mechanism housing; re-contoured the bottom of the trigger; modified the trigger pin so the slots are “not quite as deep and actually engages on the ambidextrous slide stop lever in both spots versus the one spot on the old style”; and the trigger bar has been modified to work with the new trigger spring. In other words, there’s a lot of new stuff under the hood, so to speak. The Gen 5 Glocks do appear to have a fair bit going on, despite looking like…well…every other Glock that’s come before it. How will it work? It’s impossible to say for certain without firing it, obviously. Luckily, the guys over at The Firearms Blog (www.thefirearmblog.com/blog/2017/08/25/gen5-glock-17-19/) got to handle these for a while and filmed it. Here’s their video on not just the specifics of the details mentioned above, but also their impressions on the weapon itself. Heckler & Koch has brought out its new VP9SK, a subcompact version of its highly popular and incredibly reliable VP9 full-size pistol in 9mm. A few years back when Heckler & Koch unveiled its VP9 9mm striker-fired pistol, it made a pretty substantial splash in the gun industry. In the time since, the VP (which stands for Volkspistole, or “people’s pistol”) line has only continued to grow. Within the past two years, HK has added a .40 S&W variant in the VP40 and tactical models and different finish options for both calibers. Now, the company is at it again with a new subcompact model in the VP9SK. Announced just ahead of the recent NRA Annual Meetings & Exhibits in Atlanta, the new HK VP9SK is the first subcompact offering in the VP family of pistols. As such, it offers added concealabilty while retaining the great features of its larger brethren. This includes HK’s VP precision strike trigger, which has a pretty high reputation courtesy of its crisp, single-action break and quick reset. The adjustable ergonomic grip, a major highlight of earlier VP models, has obviously been scaled down with the VP9SK. However, its functionality and flexibility remain the same. The grip adjusts to fit any user via the interchangeable backstraps and lateral grip panels, and there are also finger grooves on the front of the grip instinctively placed for shooters. As an added bonus in the ergonomics department, the VP9SK’s controls are also completely ambidextrous. 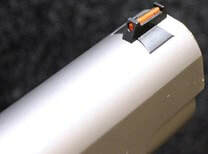 There are slide releases on both sides of the frame, and the gun’s paddle-style magazine release favors both right- and left-handed shooters. And, the new VP9SK also carries over HK’s patented charging supports found on earlier full-size models — polymer inserts mounted on each side of the rear of the slide that offer improved leverage for manipulation. Of course, the most important difference is the change in dimensions, which takes the VP9 from a full-size duty pistol to a subcompact perfect for concealed carry. The VP9SK shaves .73 inch off the overall length of the VP9, .84 inch off the height and 2.49 ounces off the weight. Some of those figures might not sound that impressive, but it’s just enough to make the VP9SK a serious contender as a carry gun. The new VP9SK incorporates an abbreviated Picatinny rail up front, an addition not all carry guns feature but one that’s beneficial for those using a laser sight or a weapon-mounted light. The gun is compatible with a variety of HK magazines, including compact double-stack 10-rounders with flat or hooked ergonomic floorplates. 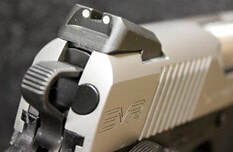 According to HK, later in the year there will also be 13- and 15-round magazines with sleeves that mimic the grip profile of the manufacturer’s full-size VP models. The brand new VP9SK is available at a fairly reasonable $719, which, incidentally, is exactly the same as for HK’s full-size VP9 and VP40. Like other HK guns, the VP9SK comes with the manufacturer’s Lifetime Warranty. For more information, check out the specifications below, or visit the HK-USA website. If you start talking 300 yard precision with a 22 LR be prepared to receive a few funny looks and a lot of doubt thrown your way. However, organizations such as the NRL22, the Lapua Rimfire Practical Rimfire Challenge, and others have started to showcase what a 22 LR can do out to 300 yards. It is very impressive watching what these shooters can do. If the interest level at SHOT Show was any indication, its really catching on! Sharpshooter Kirsten Joy Weiss wanted to test her hand at 300 yards with our redesigned Inferno rifle. In typical Kirsten fashion, she made the shot about as difficult as possible and showcased her incredible shooting ability. Takes Ruger ARX & Inseptor ammo to the next level! The Predator is an OWB pancake style belt slide holster meant to hold tightly to your body. This pancake holster is extremely low profile and slim for easy concealment. It holds very tightly to the body by design and is incredibly comfortable. In fact, it is our favorite leather holster. 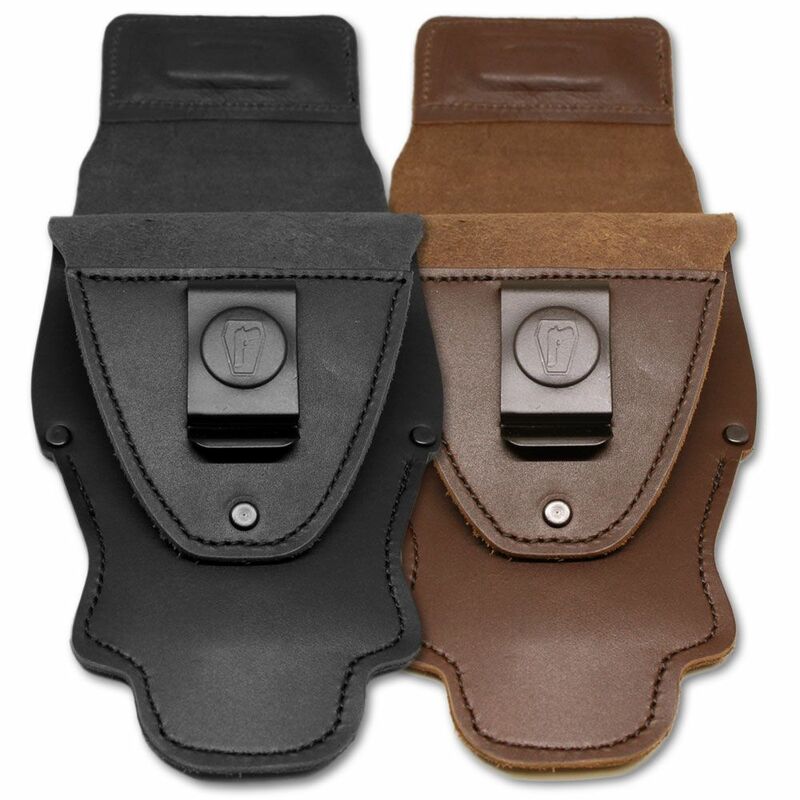 It features a stiffening strap across the front of the holster to keep the mouth of the holster open for holstering. The Predator features 1-3/4" belt slots that are punched so the holster rides at a 15° cant. It tilts forward but not too much, making it a perfect draw. Like all of our holsters, it also features a custom cut body shield that fits your specified gun and will not interfere with your draw. Sig Sauer announces free upgrade program for the P320. Learn more Here. Watch video below. The G2 Urban Carry is a uniquely designed holster to comfortably carry your concealed firearm with any outfit for nearly any situation. Proudly made in the United States of America the Urban Carry is made with 100% genuine saddle grade leather. The G2 Urban Carry is a rapid deploying uniquely designed holster to comfortably carry your concealed firearm with nearly any outfit for any situation. The G2 was born from the voices of the thousands of people who wear the original Urban Carry everyday. Collaborating with the collective suggestions the G2 is an upgrade making an amazing holster even better. A unique patented design which keeps your firearm BELOW your waistline. This allows for natural movement of the body throughout the day without the pain of a firearm digging into your stomach or leg. With the firearm holstered below the waistline there is no need “dress around your gun”. Wearing normal fitting pants, shorts or slacks with your regular or even fitted shirts will not expose any part of the firearm. Tuck in your shirt, or leave it untucked. The firearm is completely concealed and draws the same either way. A custom steel clip, tough enough to withstand the pull of any stressful situation, secures the holster with or without a belt. The G2 has an improved holster design which guides your firearm directly to your hand for a smooth and rapid draw, every time. Pre-conditioned leather eliminates the long break-in period and allows your firearm to seat perfectly in your holster much sooner. A powerful magnet at the base of the holster keeps your firearm secure and steady during a rapid draw. A laser compatible option with a wider base and built in ECR technology so your ECR enabled laser fits perfectly and automatically turns on when drawn and off when holstered. All of the G2 holsters are handcrafted in Tennessee, USA with 100% genuine Saddle Grade leather. 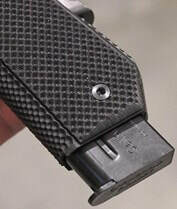 The G2 holster is not gun specific but it is size specific. Ensure you have the right size holster for your firearm as if it is too large the firearm will sit too high creating an uncomfortable dig into your stomach. If the firearm is too small for the holster it will be difficult to draw. View Urban Carry website HERE. The Pistol Mask is a concealed carry holster designed to look like a cell phone. 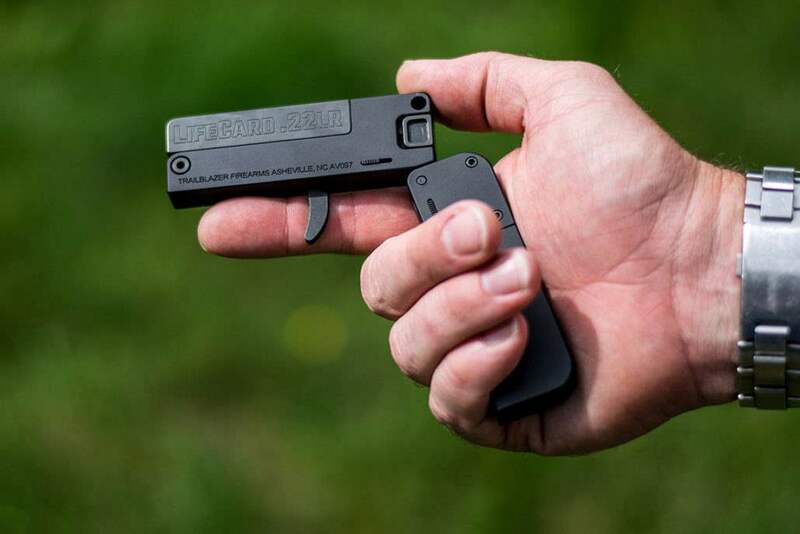 It enables users to carry a large caliber pistol without drawing attention. Injection molded with glass-filled Noryl, the holster uses magnets to keep its panels securely closed. Spring-loaded hinges enable it to be quickly opened for instant access. 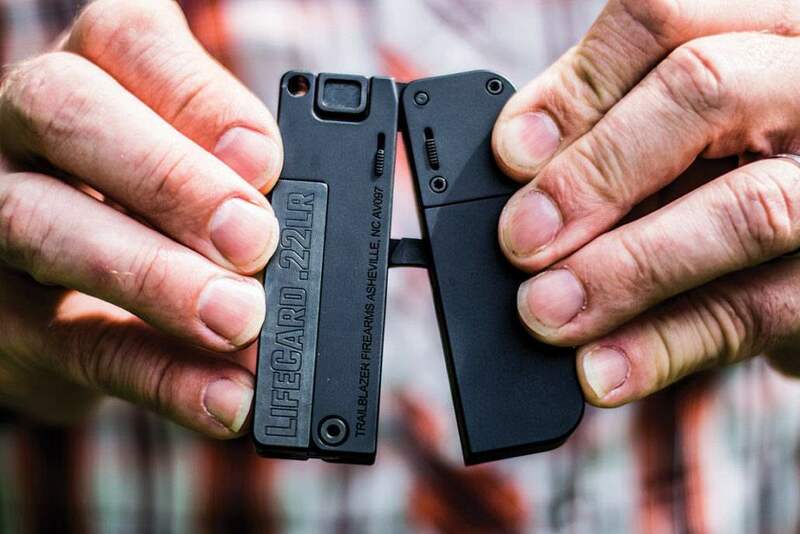 Trailblazer Firearms, a relatively new gun manufacturer, just launched its first ever product, the LifeCard .22 LR, and it looks like a gadget straight out of a James Bond film. 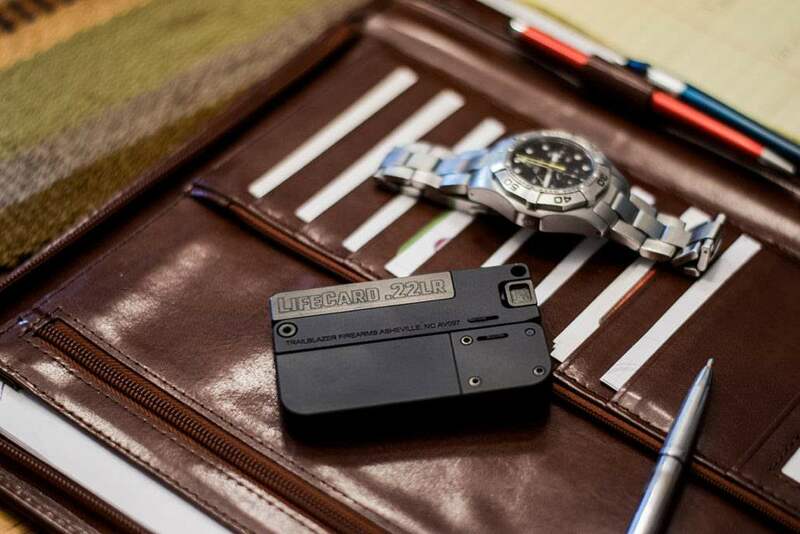 The LifeCard is a single-shot, single-action, folding .22 LR…that can fit in your wallet. That’s right, the gun is no bigger than a stack of credit cards; it comes in at 3.375 inches long, 2.125 inches tall, and 0.5 inches wide. Oh, and it weighs less than seven ounces. According to the press release, the tilt-up barrel, bolt and trigger are made of steel with an Isonite finish to prevent corrosion. Meanwhile, the frame and handle of the gun are made of aluminum with a hard-coat black anodized finish. While the pistol is a single-shot, the handle serves as an ammunition storage case that can hold up to four extra rounds. And, as a build in safety feature, the gun cannot fire while in its folded state, as the trigger is not accessible. President of Trailblazer Firearms, Aaron Voigt, who has served in both the Marine Corps and the Army, said the gun took seven years to bring to life. The Trailblazer is set to hit stores in mid-August. It retails at $399. However, before you head over to your local gun shop, a spokesperson for Trailblazer Firearms wants you to know exactly what the gun was designed for. Now, we’re left with just a couple of questions: How does it shoot, and would you use one of these?